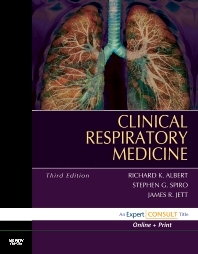 This comprehensive clinical textbook examines all aspects of respiratory medicine. The editors take a practical approach to the diagnosis and management of patients with the full range of pulmonary disorders, making this your ideal source for reference in clinical practice. Fully revised, this essential volume includes new chapters on PET imaging, implications of genetic research, oxygen therapy, and rehabilitation. Now an Expert Consult title, it comes with access to the complete contents of the book online, including all of the book’s images, downloadable for use in presentations. Provides complete clinical coverage so you can Better manage and treat patients with pulmonary disease. Uses templated, clinical chapters for consistent, concise, essential information. Includes coverage that reflects the way you practice medicine today with critical information relevant to everyday practice. Utilizes diagnostic algorithms to help you find critical information and at a glance.